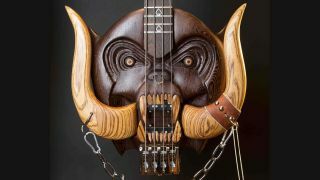 Last year, you may remember being wowed by Cynosure's phenomenal Motörhead bass models, and ahead of 2017's Bloodstock Festival, the luthier has offered a look at how these fully playable works of art come to be. The videos below document the serious sawing, staining and sanding that went into the making of these mighty impressive instruments. Cynosure's creations are a key part of Bloodstock's purpose-built RAM Gallery on site each year. The gallery is the brainchild of festival founder and renowned fantasy artist, Paul Raymond Gregory and was created to highlight the relationship between art and music. Paul commissions Cynosure each year to come up with new creations, and two more are on the way for 2017's Bloodstock Festival - Cynosure will be sharing clues on Facebook in the run-up to the event. Bloodstock takes place at Catton Park, Derbyshire on 10 to 13 August 2017. Tickets are available from the festival's website, including a payment plan option.